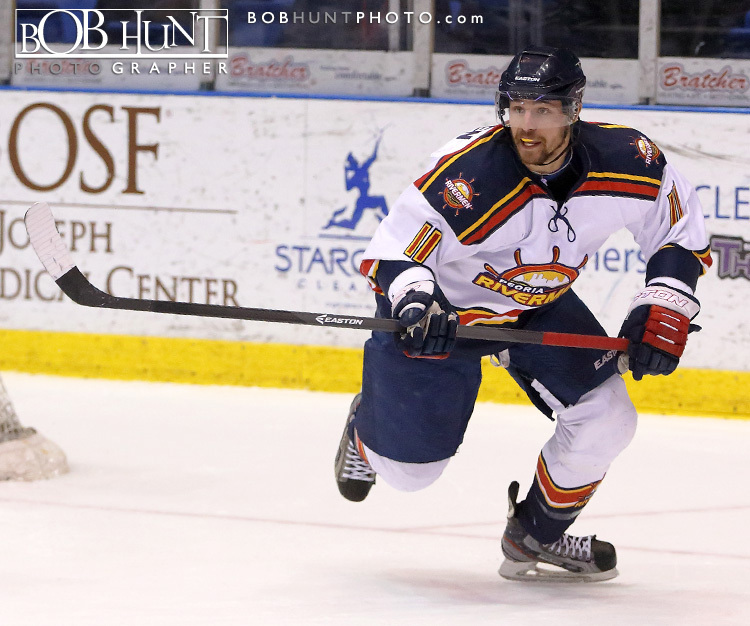 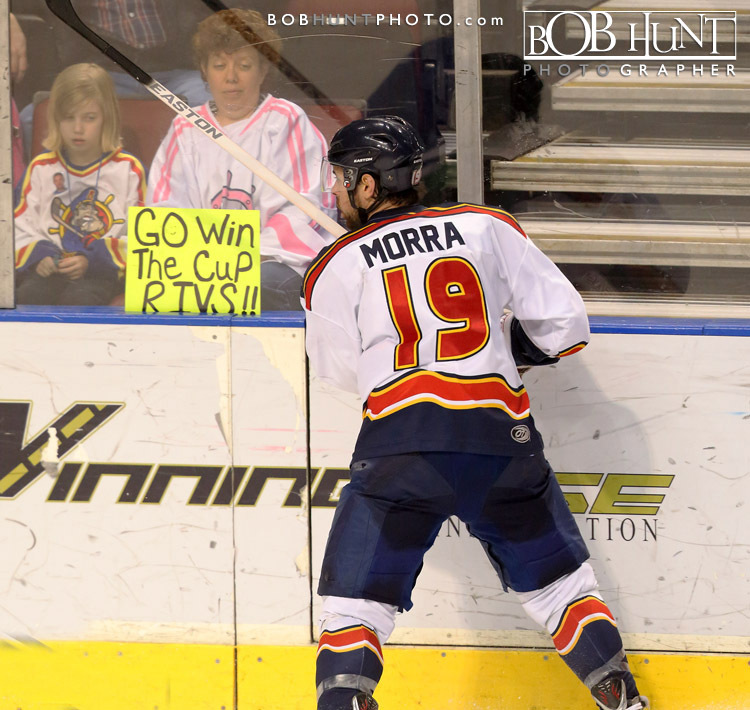 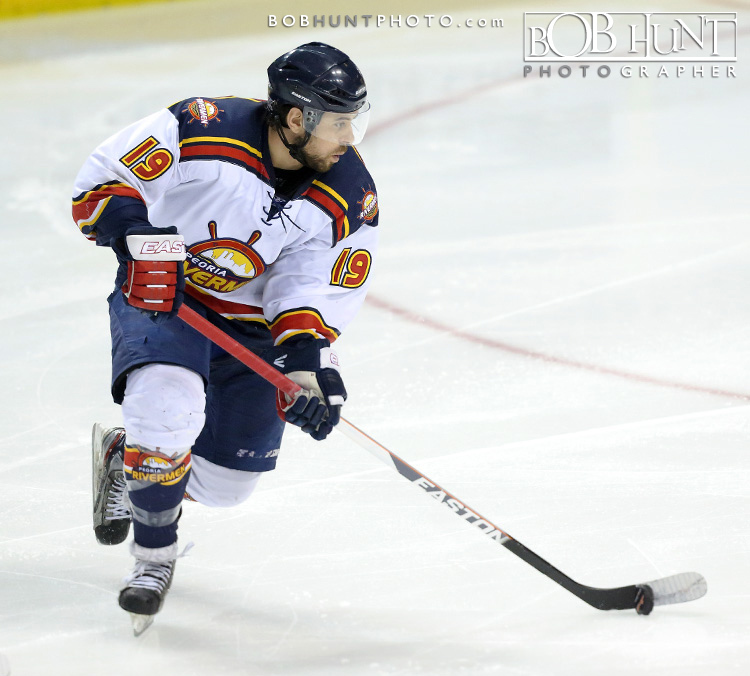 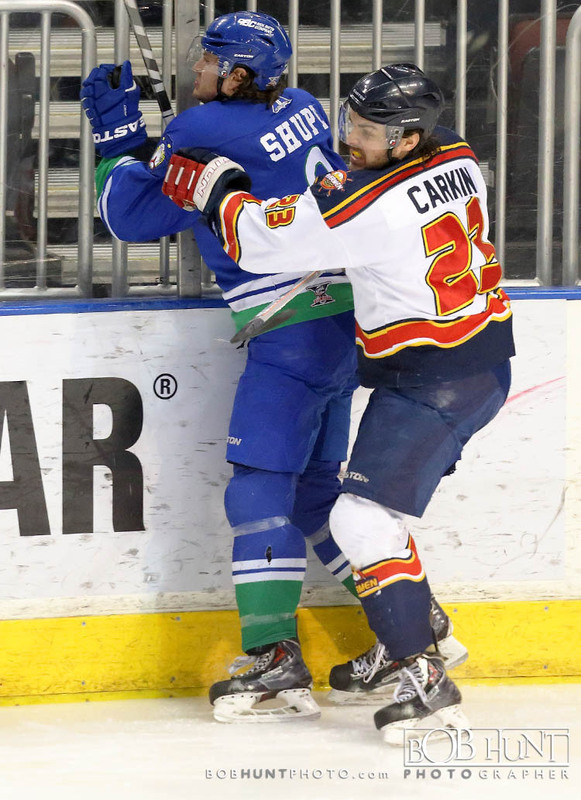 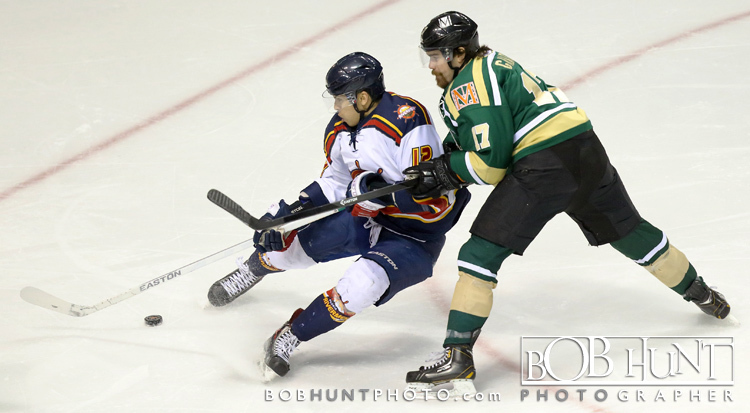 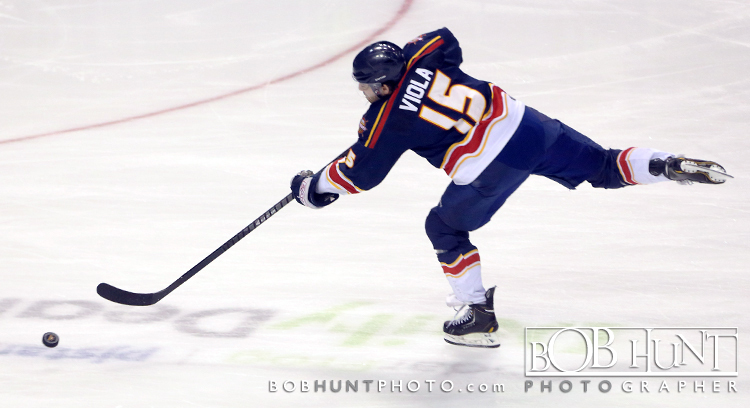 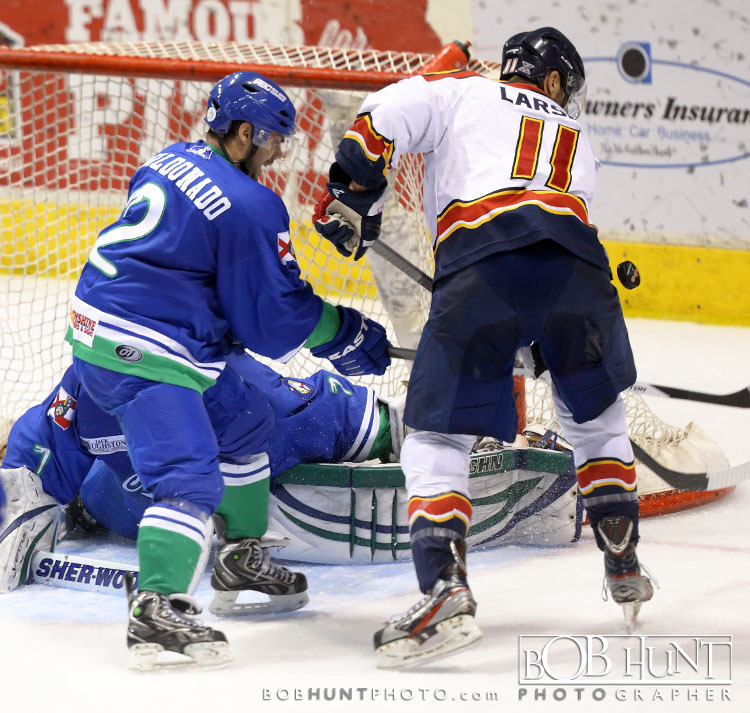 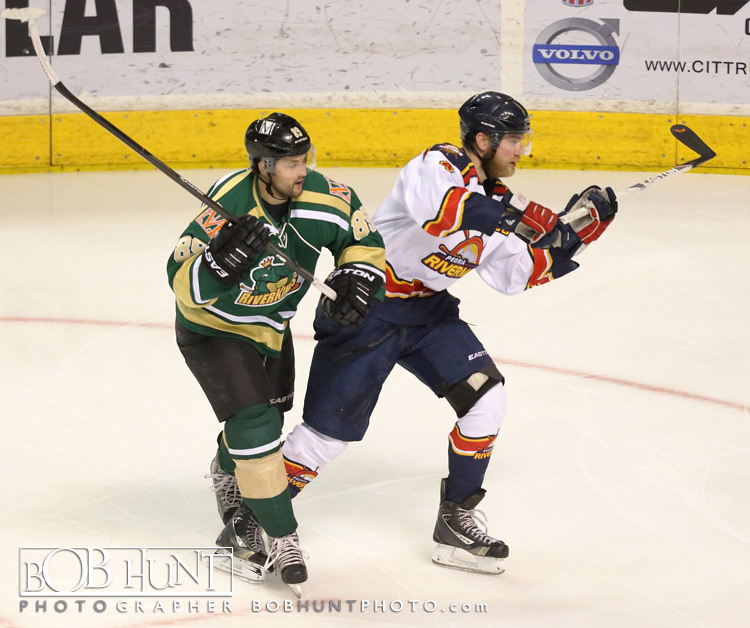 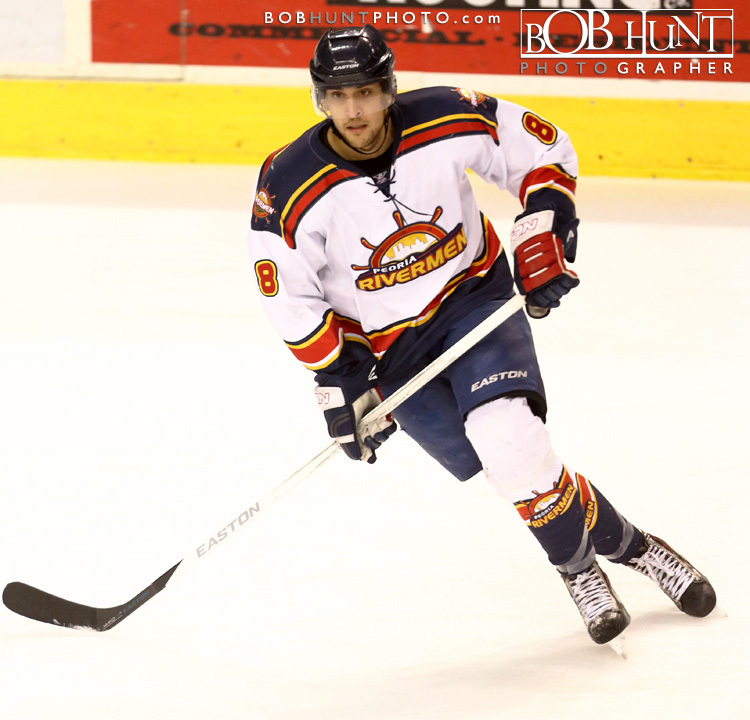 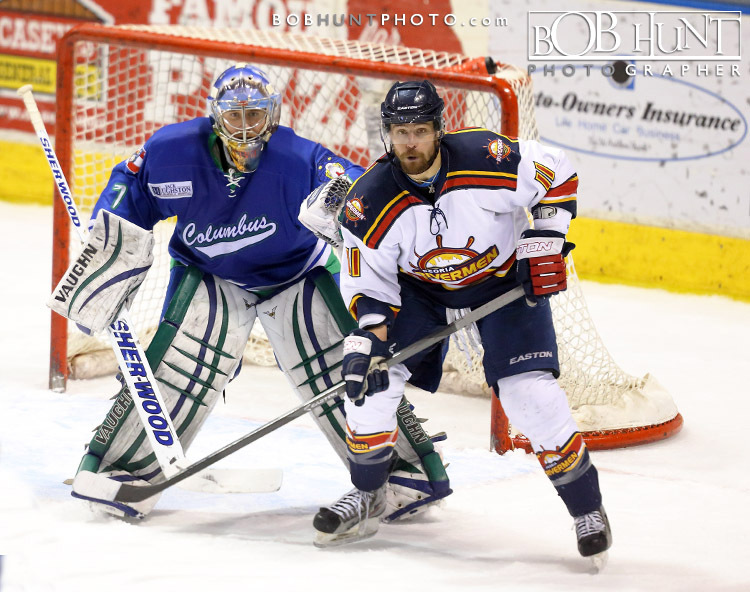 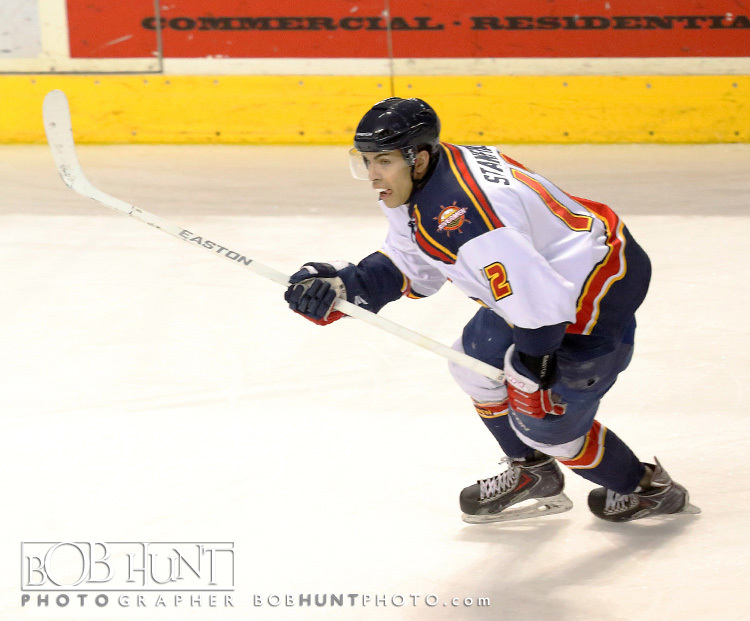 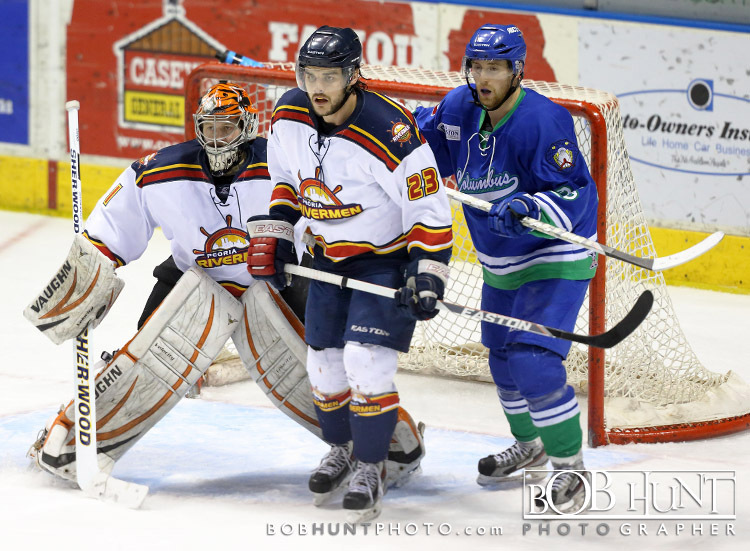 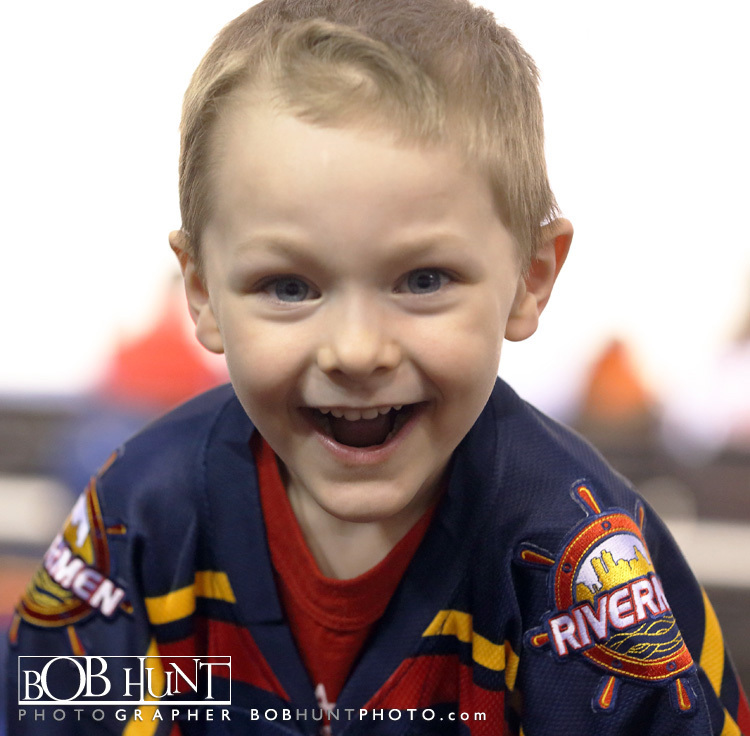 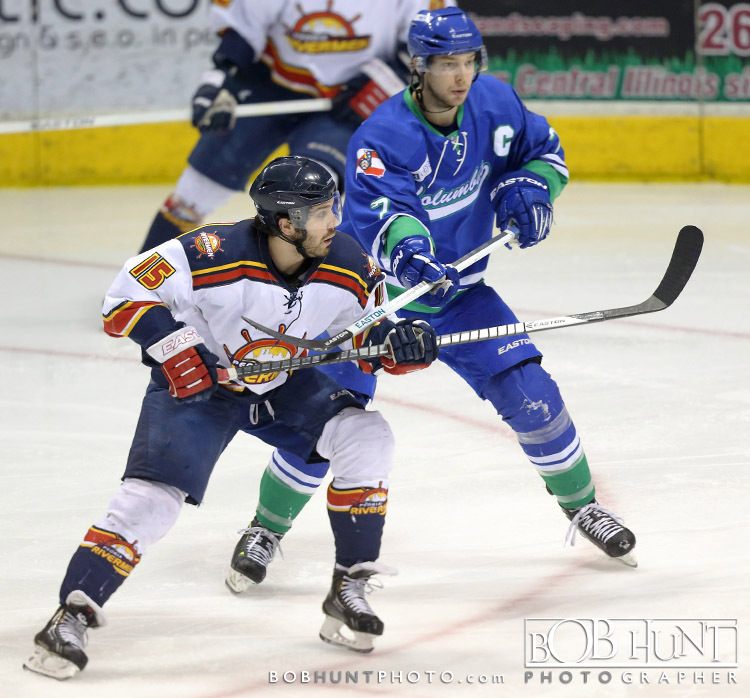 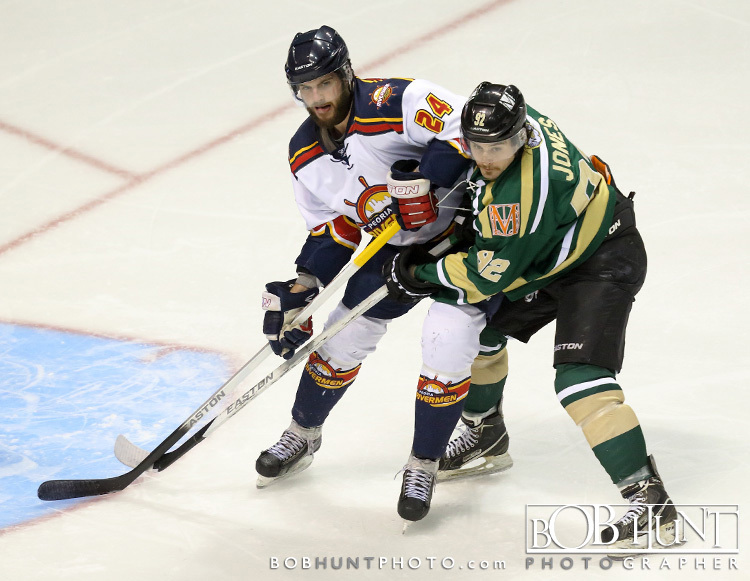 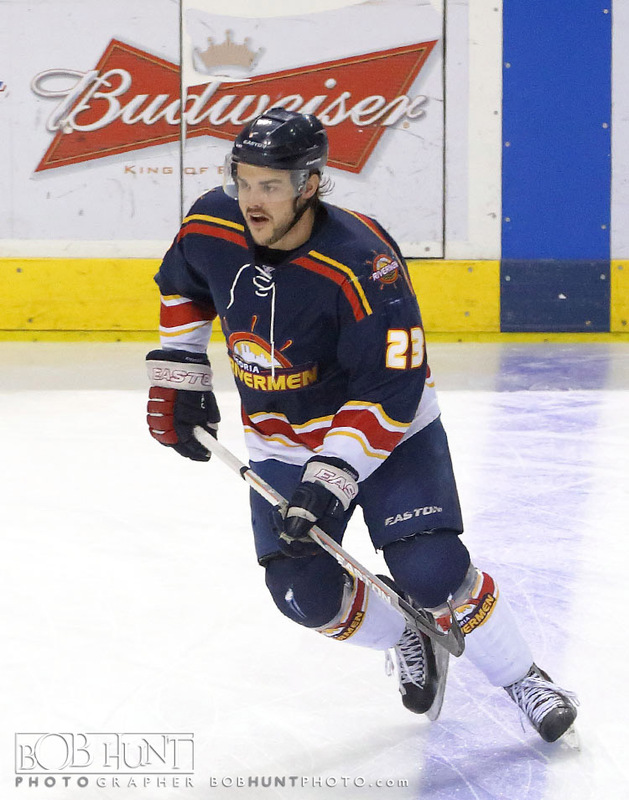 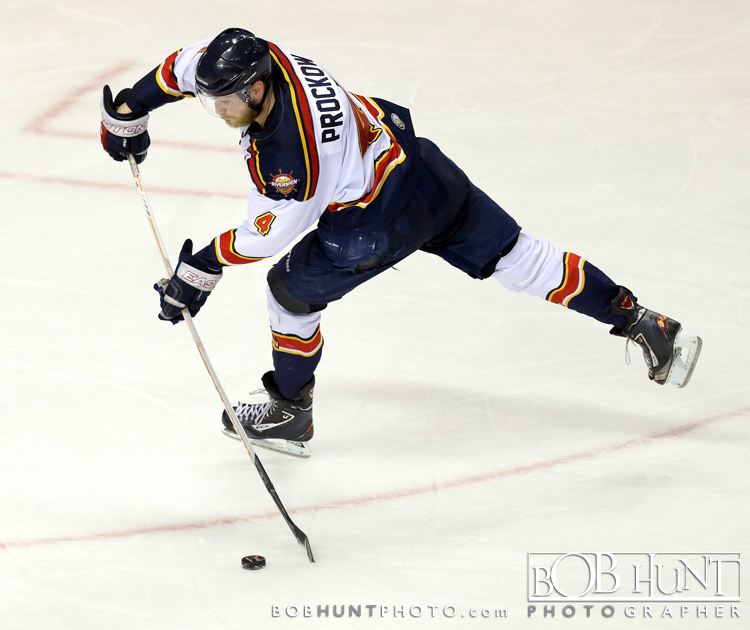 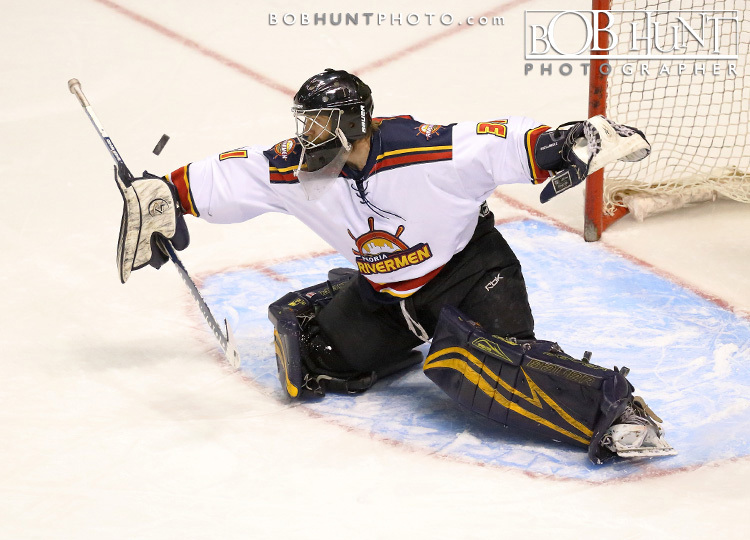 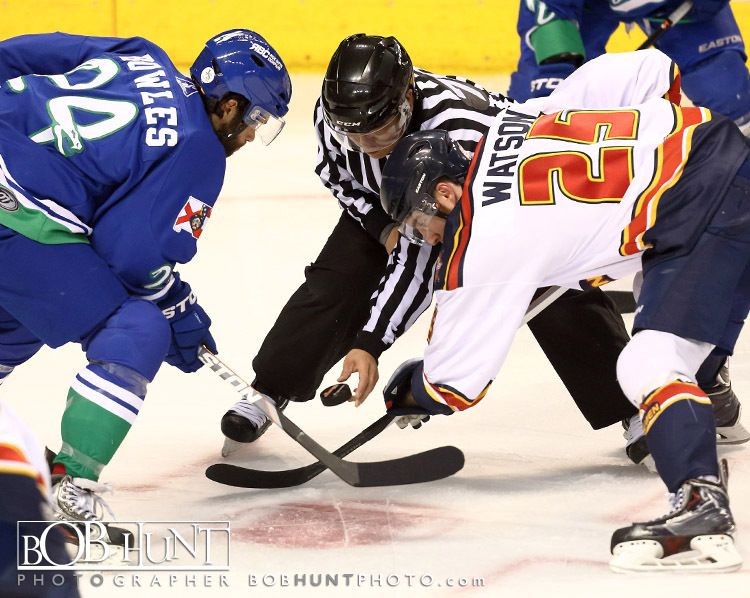 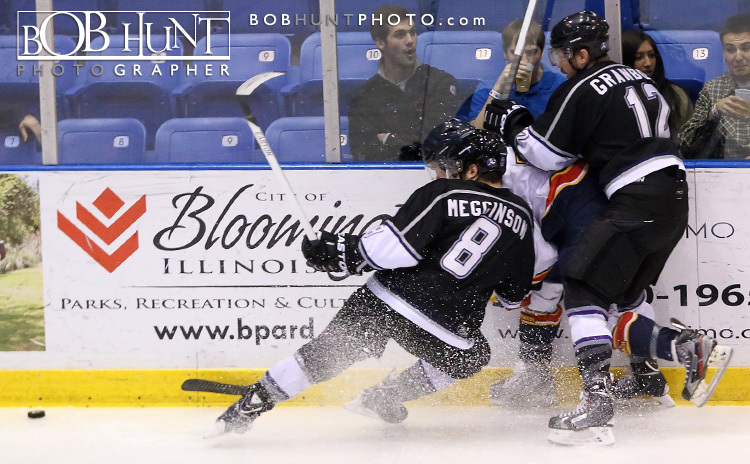 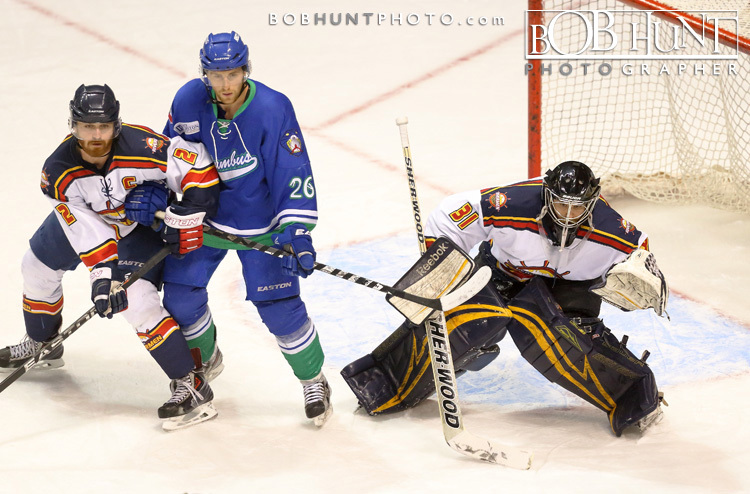 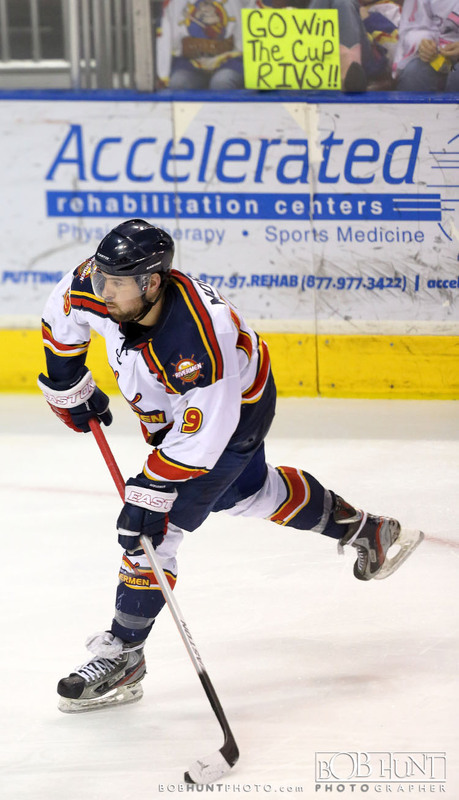 The Peoria Rivermen opened the 2014 SPHL President’s Cup Playoffs with a 2-0 victory over the Columbus Cottonmouths on Wednesday behind two goals from Garrett Vermeersch at Carver Arena. 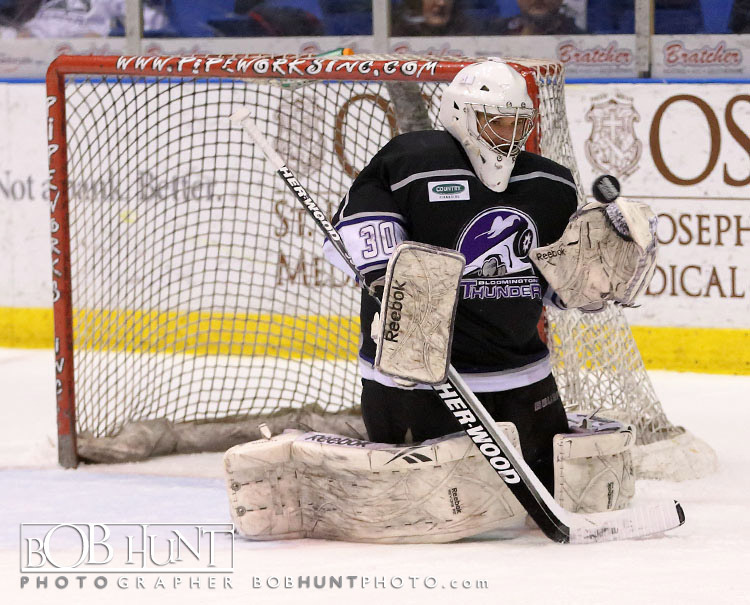 Between the pipes, GK Kyle Rank stopped all 35 shots he faced en route to his first career playoff shutout. 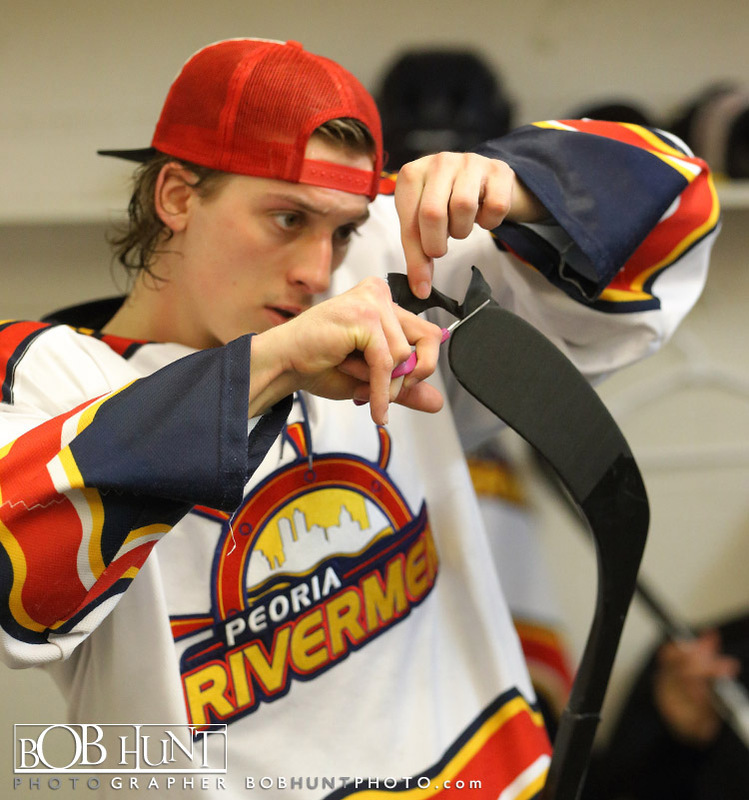 With the win, Peoria took a 1-0 advantage in the best-of-three, first-round series and is now just one victory away from the second round. 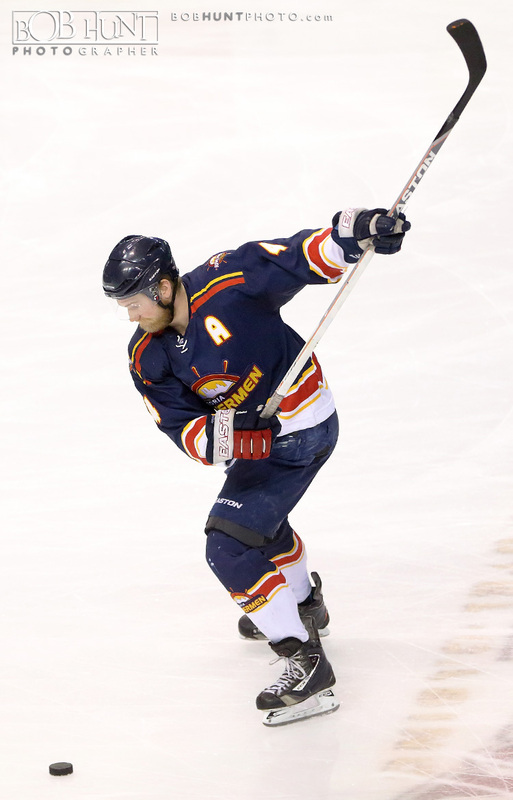 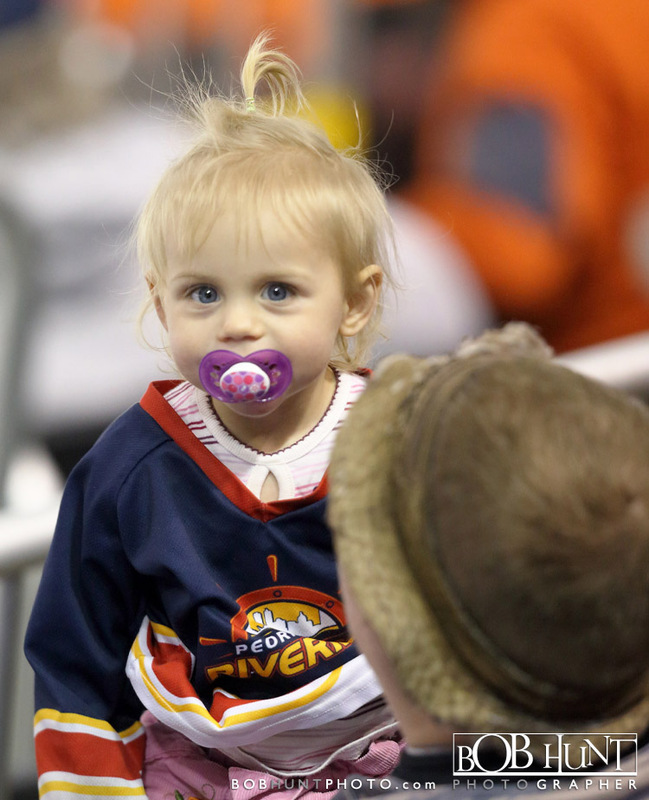 It was the first playoff win for the Rivermen franchise since April 25, 2009, when the American Hockey League team defeated Houston in Game 6 of the Calder Cup Playoffs. 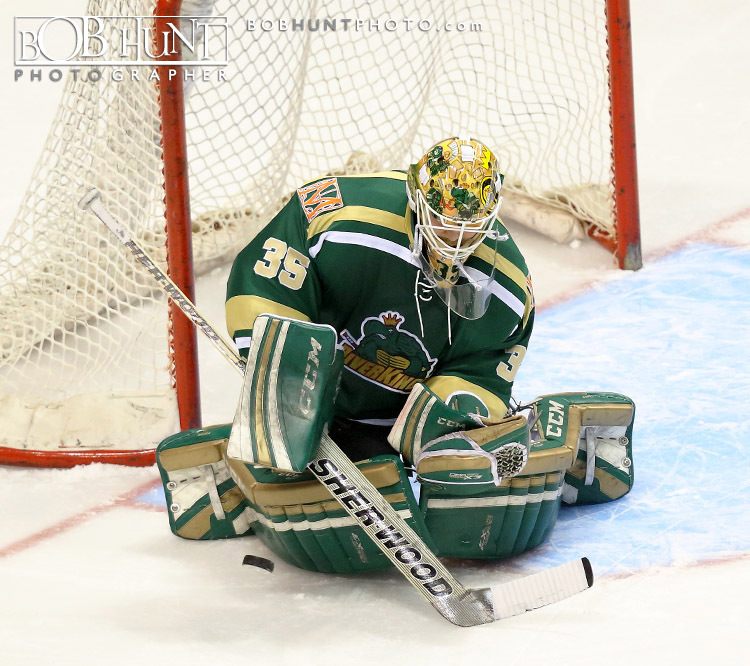 Combined with the regular season, Rank’s shutout was his ninth of the season. 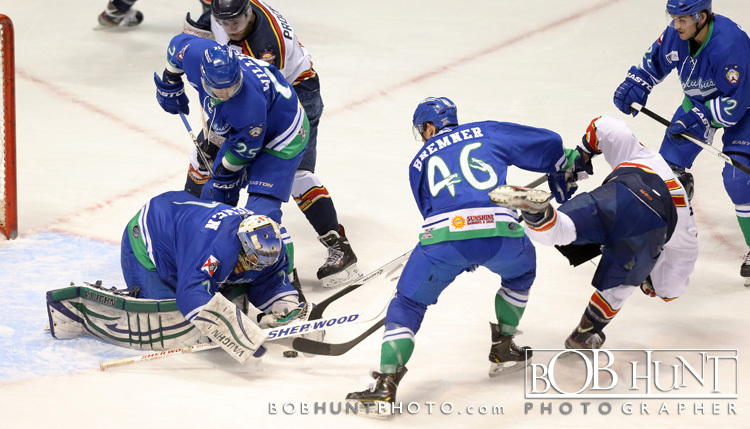 Andrew Loewen, on the other hand, made 24 saves and suffered the loss. 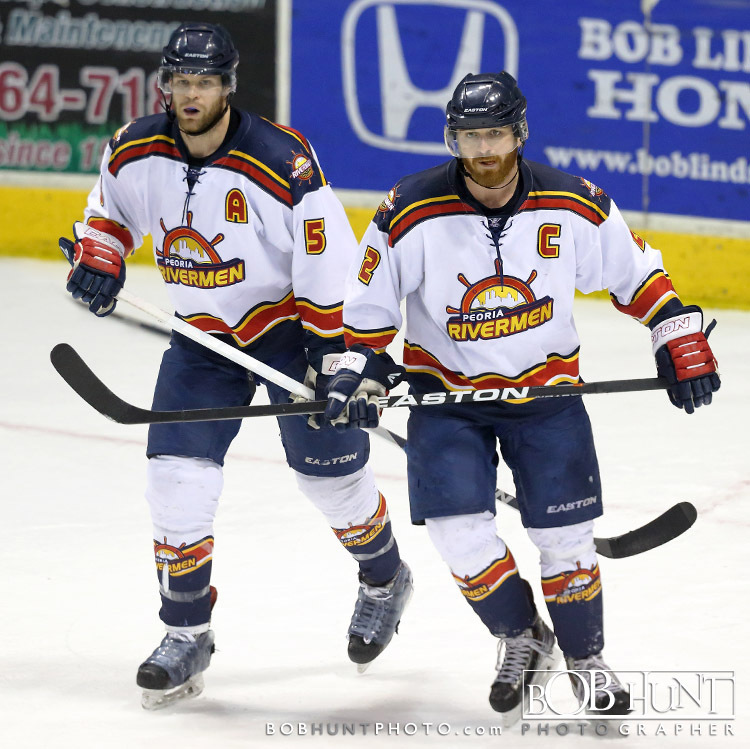 The Rivermen will continue the best-of-three playoff series with Game 2 against the Columbus Cottonmouths on Friday at 6:30 p.m. CST in Columbus, Georgia. 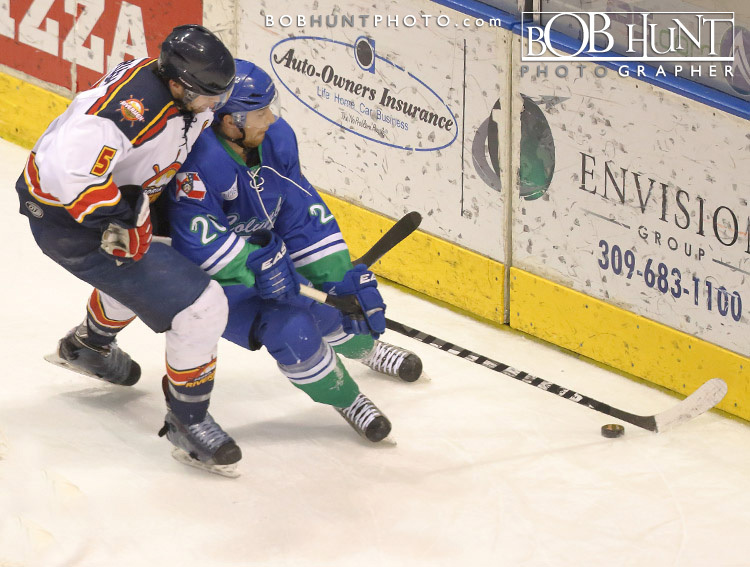 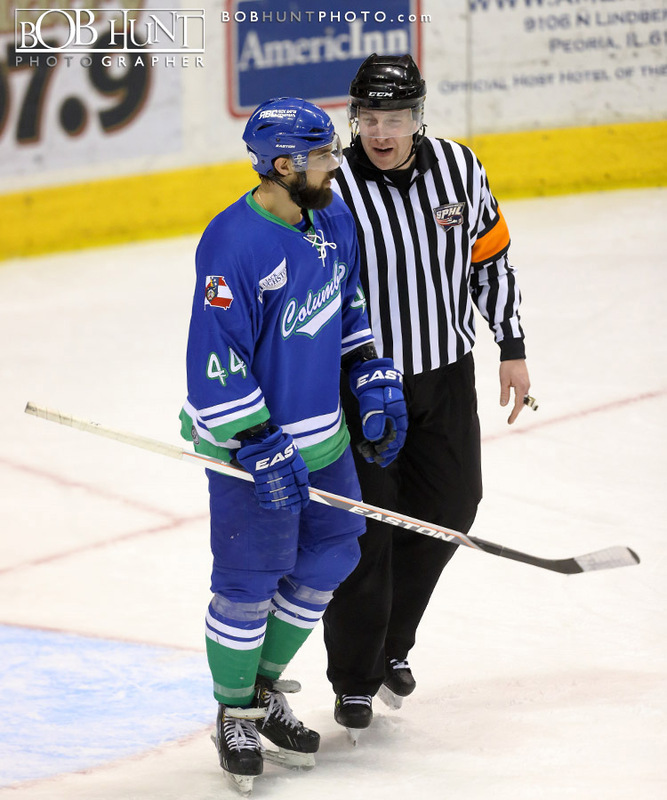 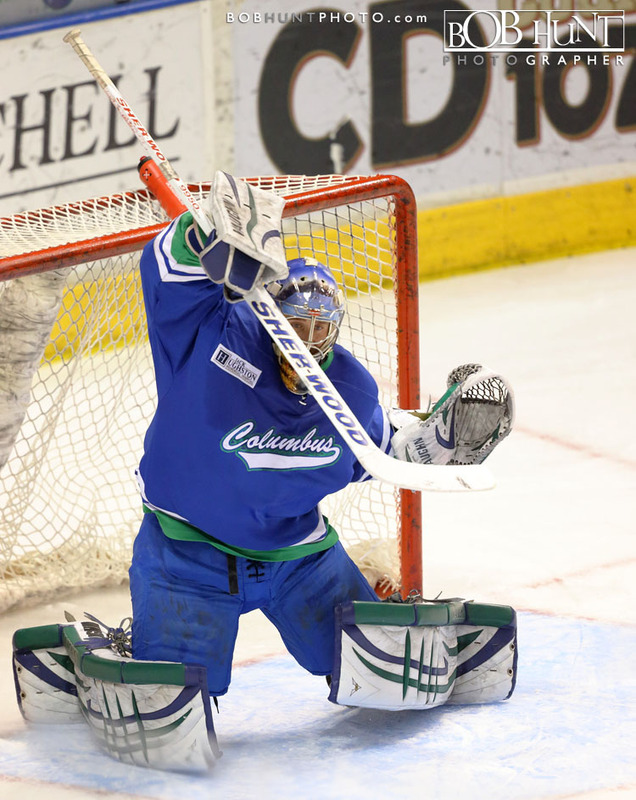 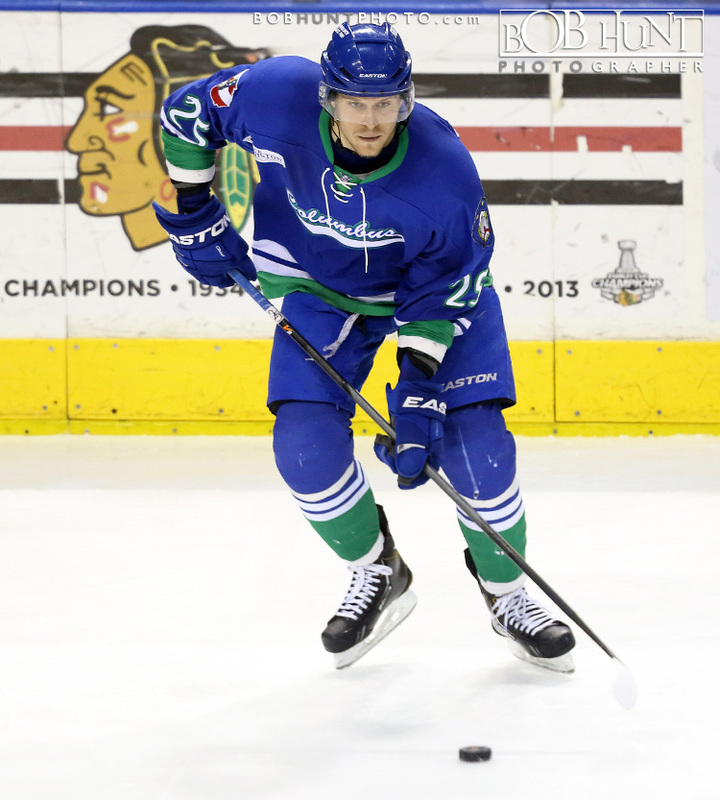 The Bloomington Thunder scored twice on a five-minute major late in the third period and defeated the Peoria Rivermen for the fourth straight game, 4-2 at the U.S. Cellular Coliseum on Tuesday. 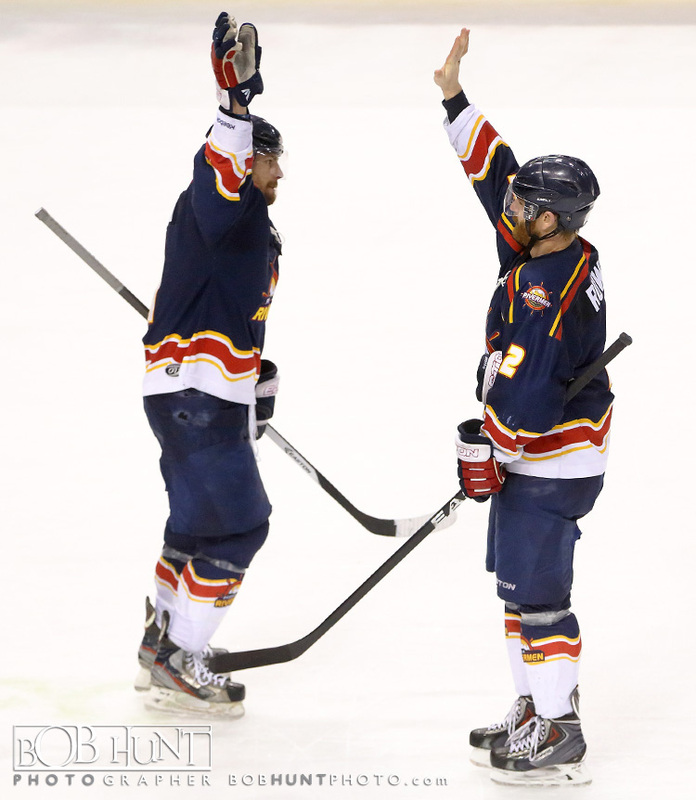 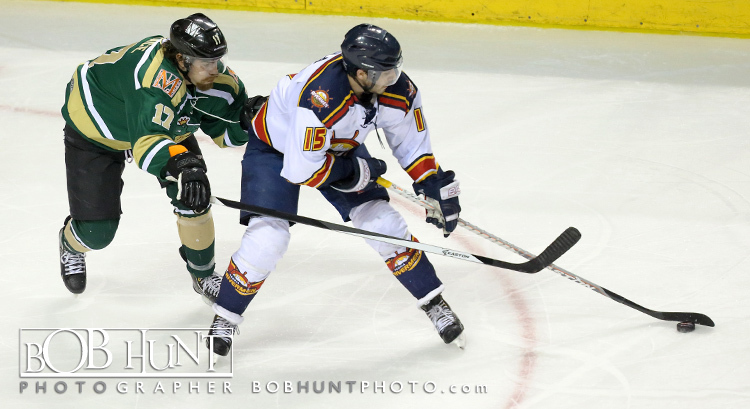 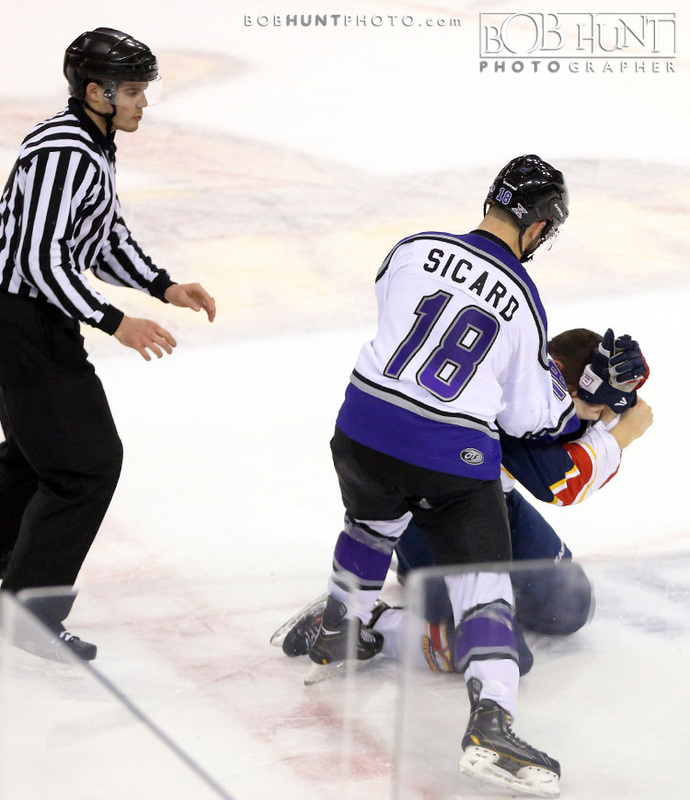 Paul D’Agostino netted the game-winner, while both Rivermen goals came on special teams. 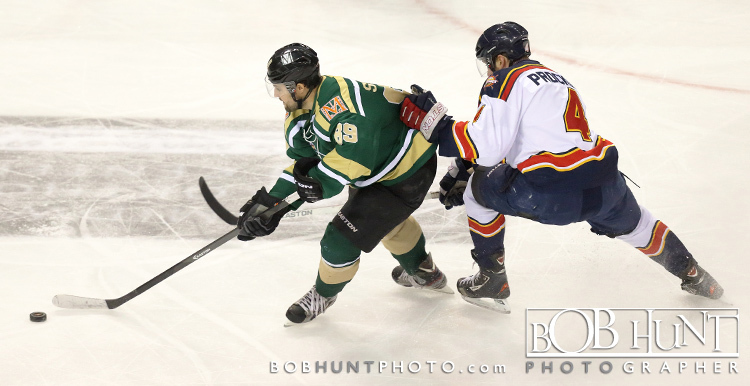 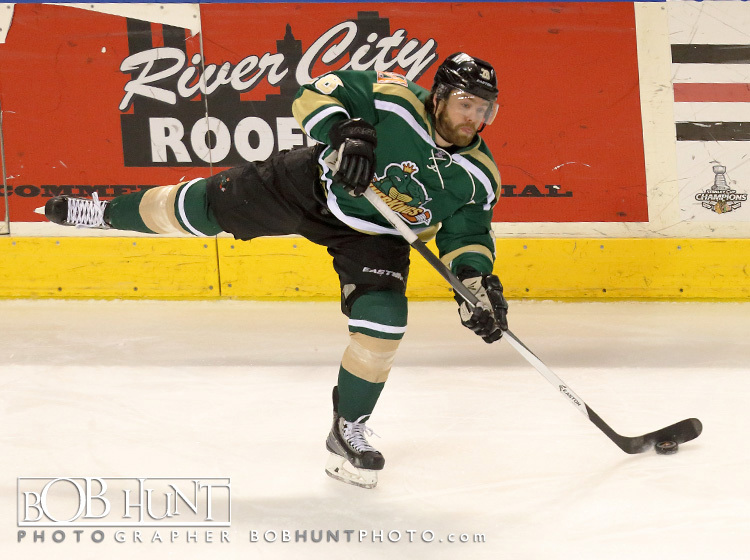 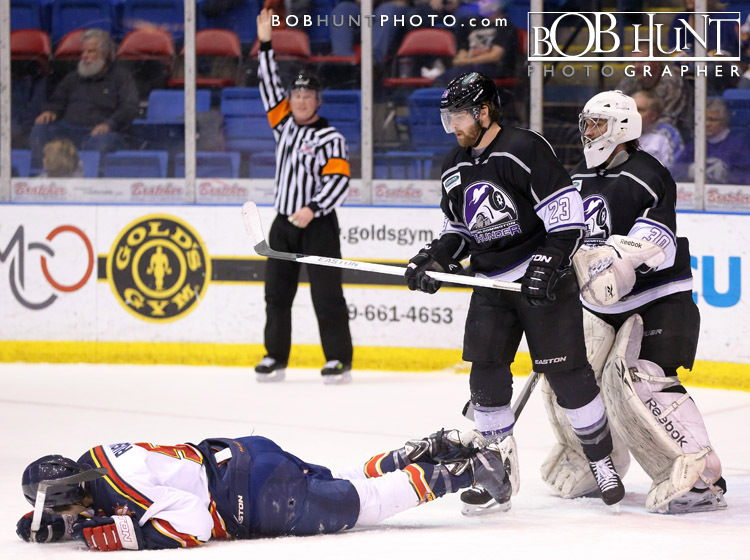 With the loss, Peoria fell to 24-17-6 on the season (54 points) and is now tied with the Mississippi RiverKings for fourth place in the SPHL standings. 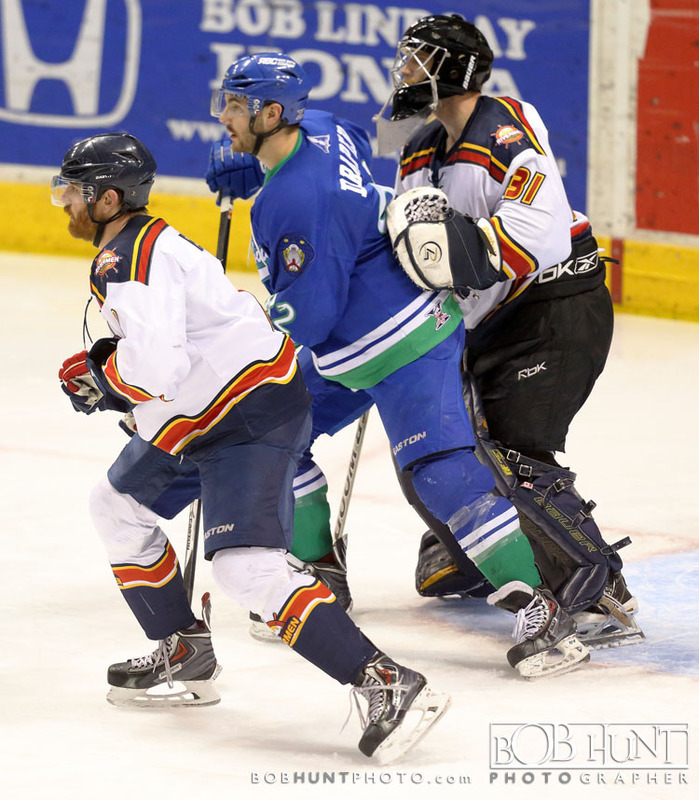 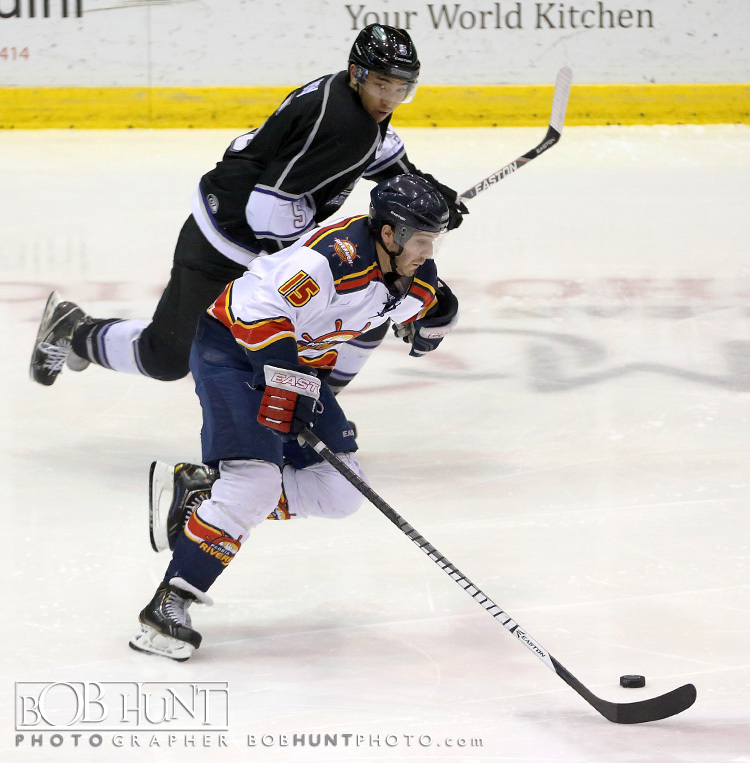 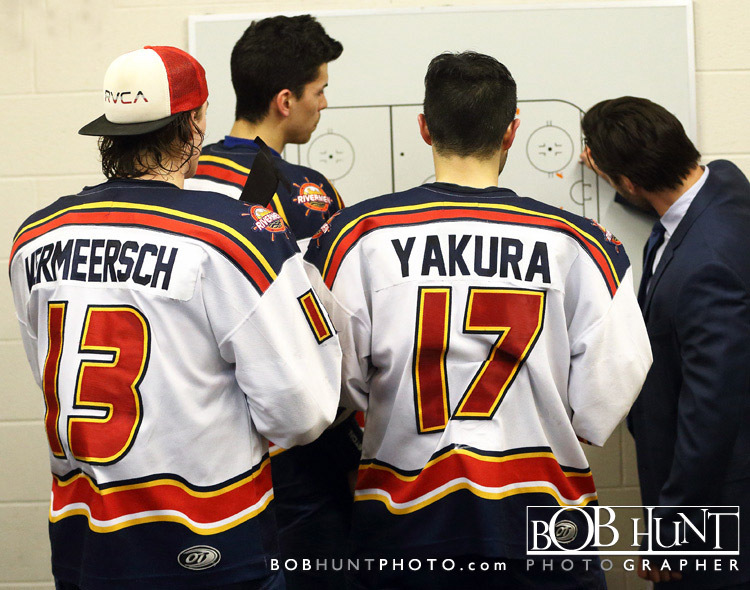 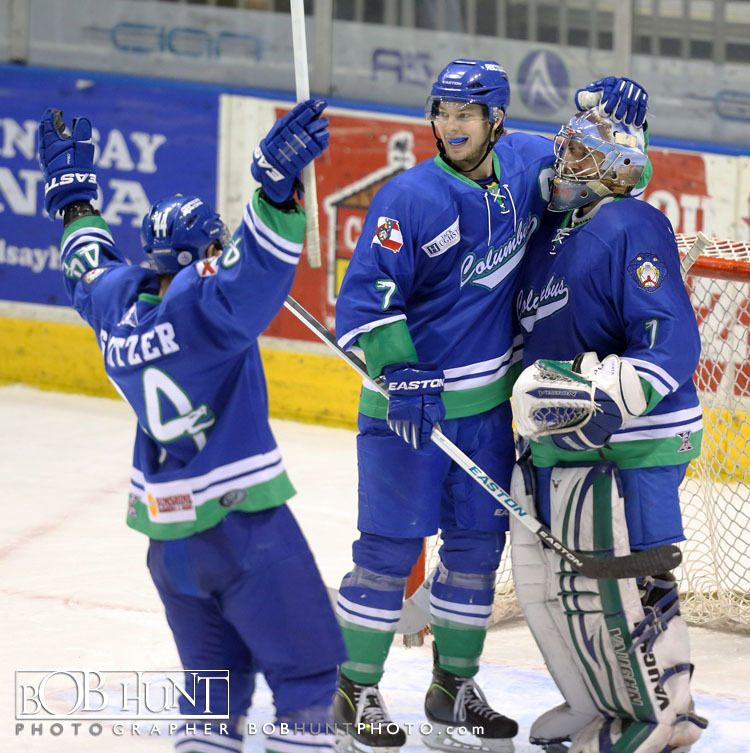 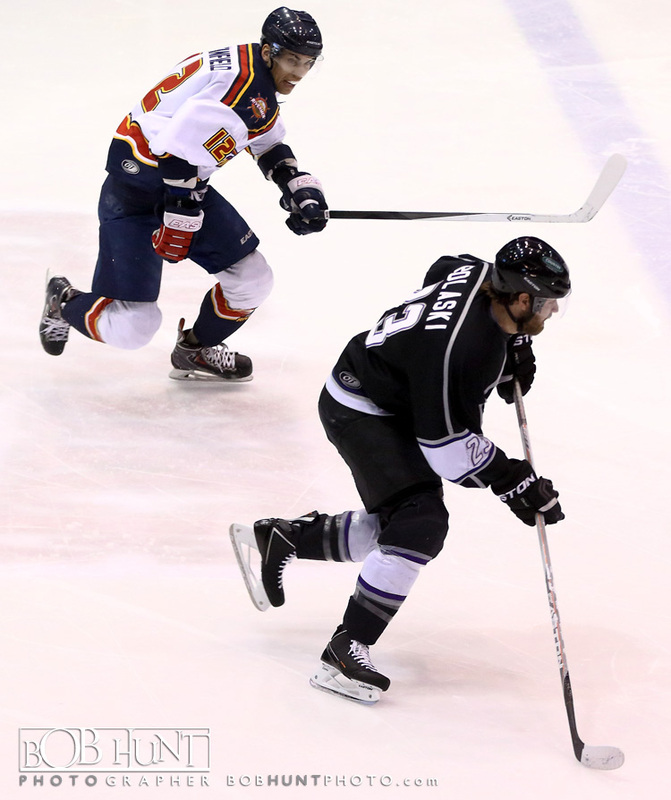 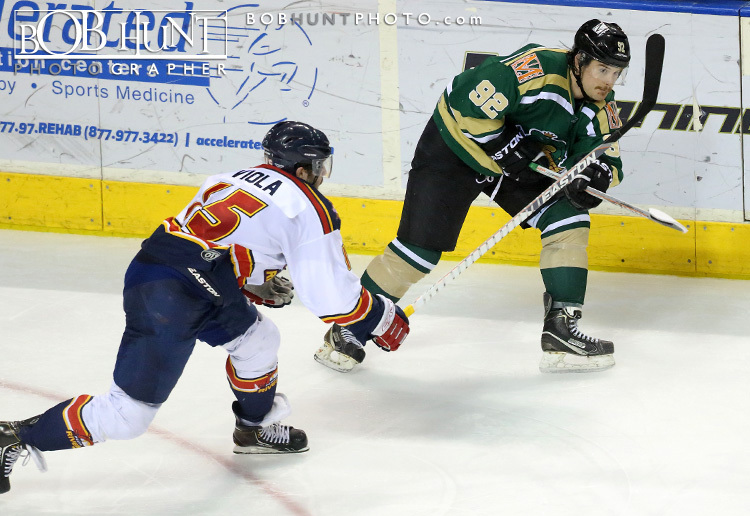 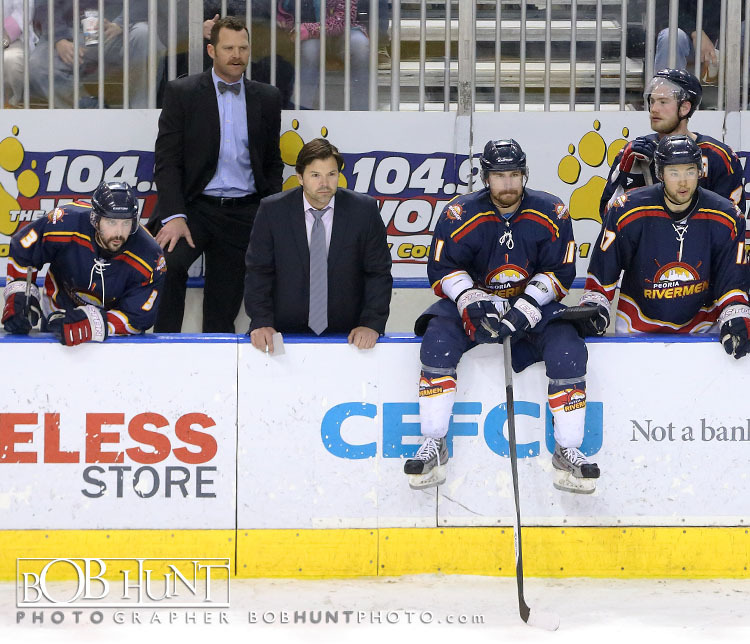 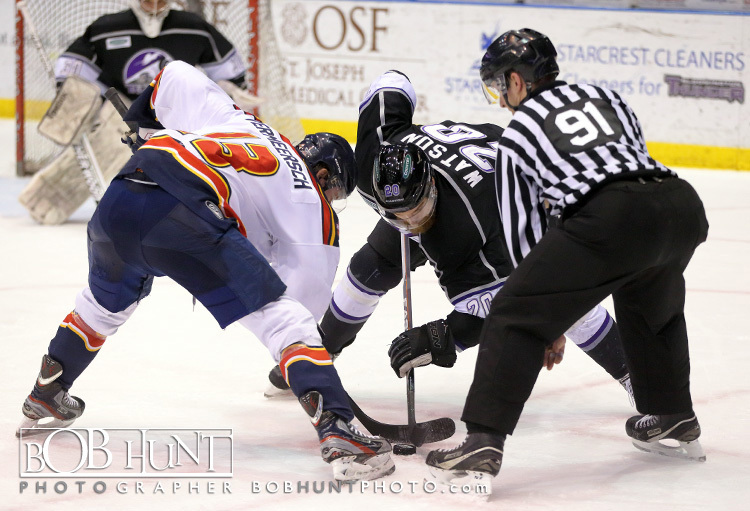 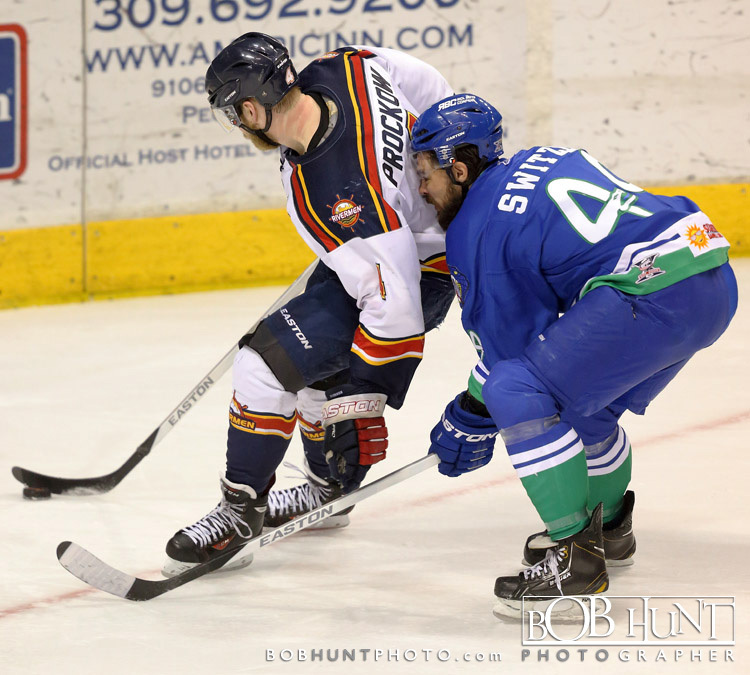 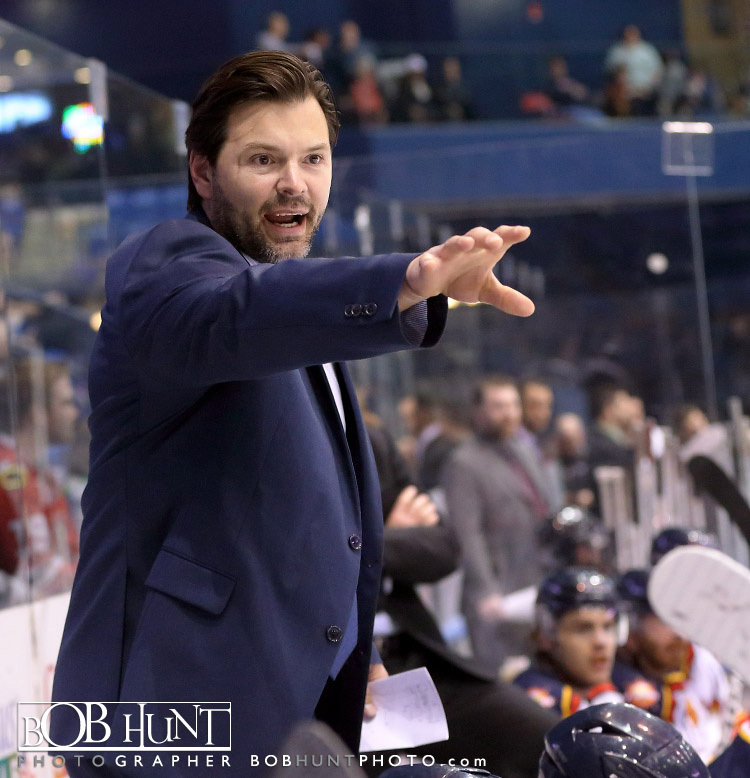 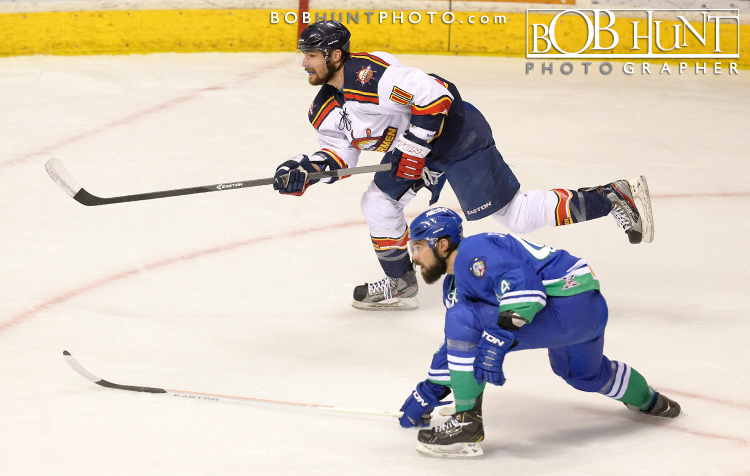 The magic number to clinch a spot in the President’s Cup playoffs remains “five” – points earned by the Rivermen or missed by ninth-place Fayetteville. 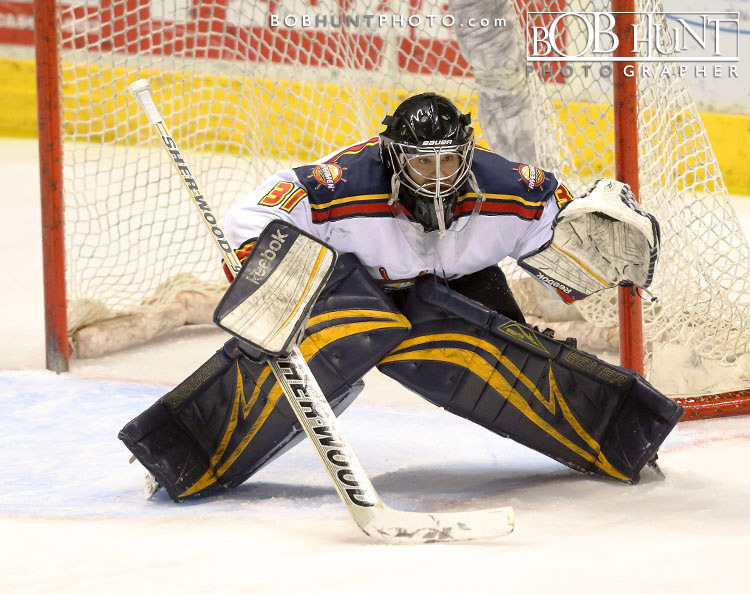 In addition, the loss extended Peoria’s losing streak on the road to six straight.Kyle Rank (15-8-2) made 28 saves but suffered the loss for the second straight game. 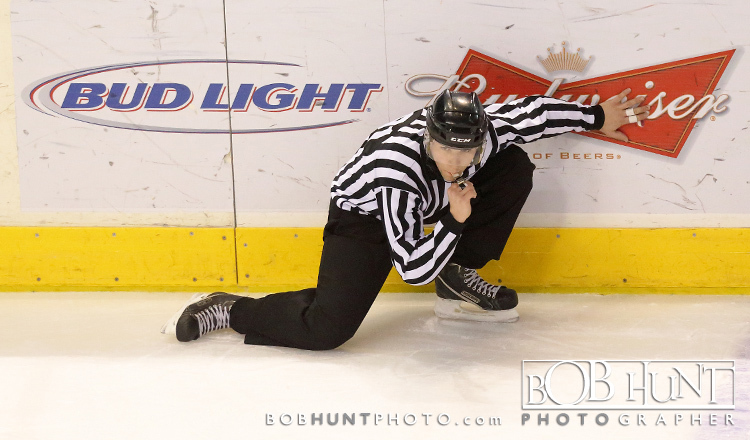 On the other side, B.J. 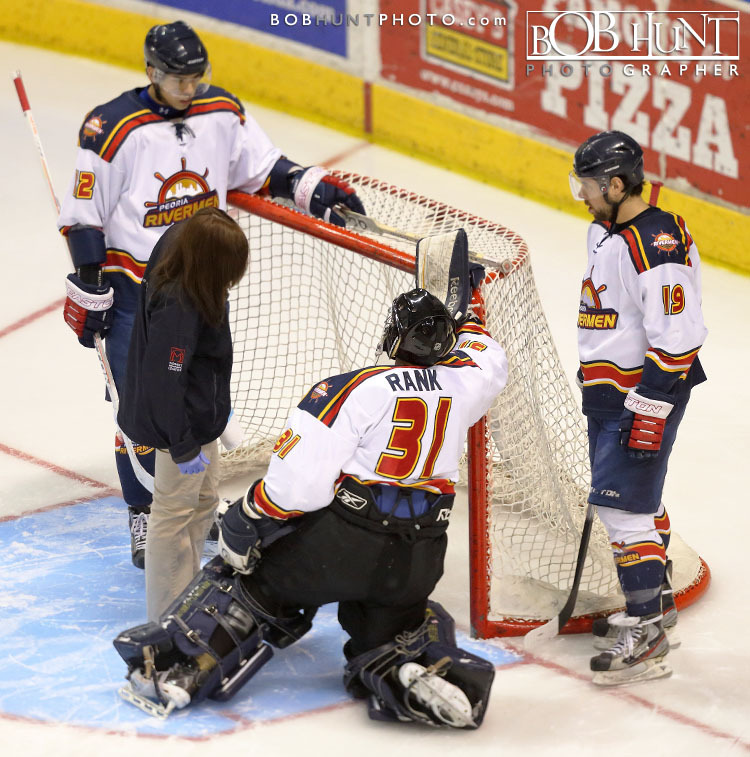 O’Brien (8-13-1) earned the win and stopped 38 chances. 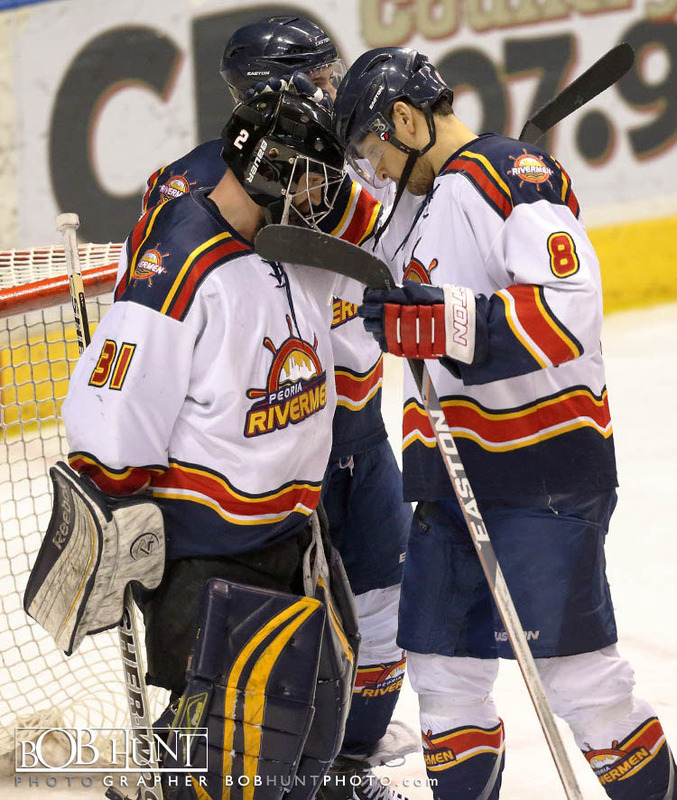 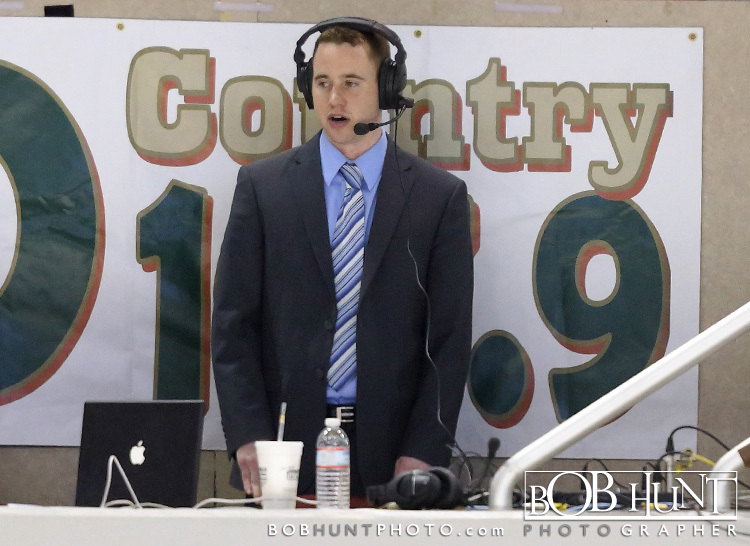 Kyle Rank stopped all 32 shots against and blanked the Mississippi RiverKings on Sunday, the Peoria Rivermen goaltender broke the SPHL record for shutouts in a season with six. 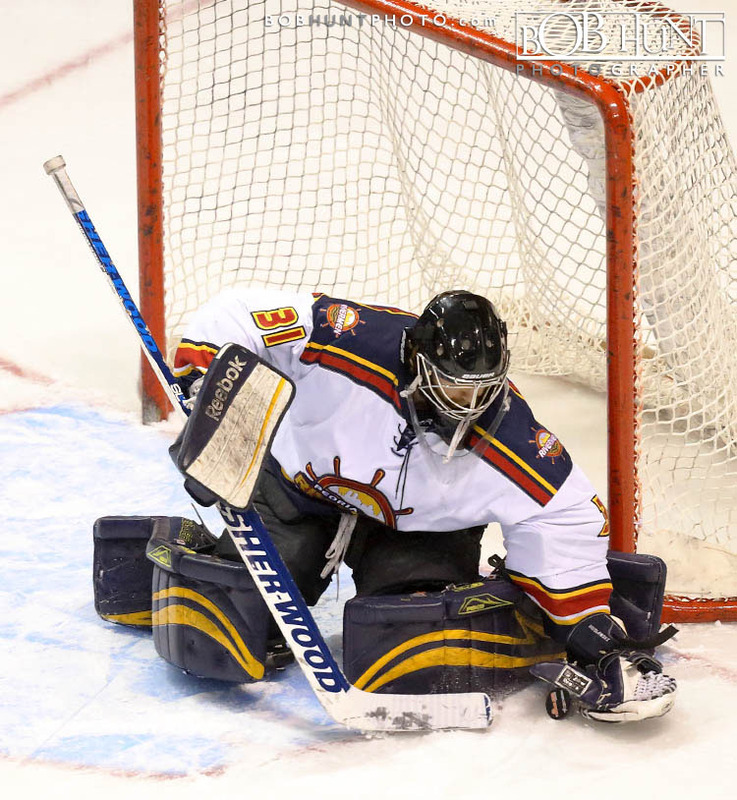 Previously, the record had been held by Louisiana’s Riley Gill, who collected five shutouts just one year ago. 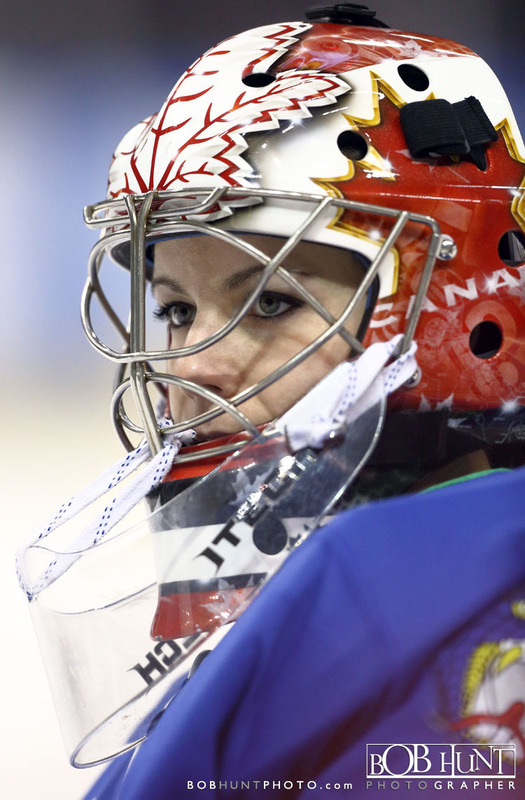 Overall, the 26-year-old leads the league with a 1.64 goals against average and .948 saves rate. 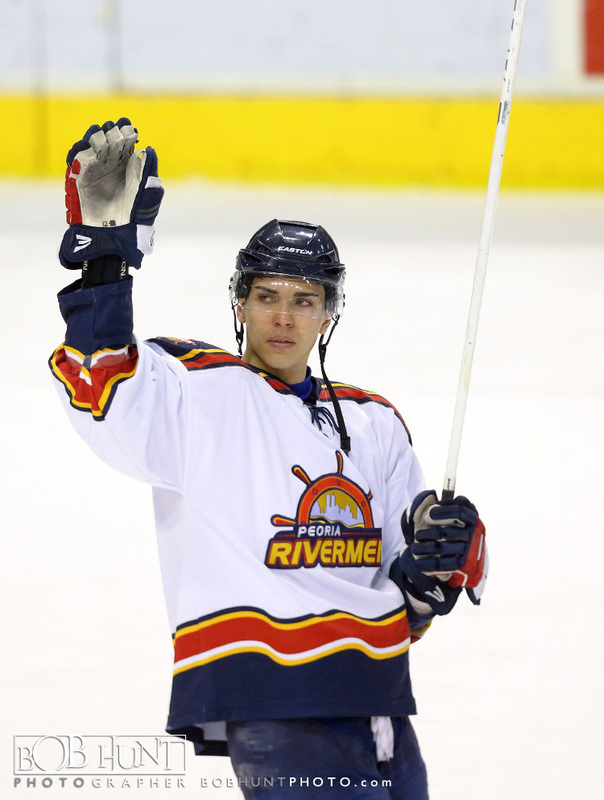 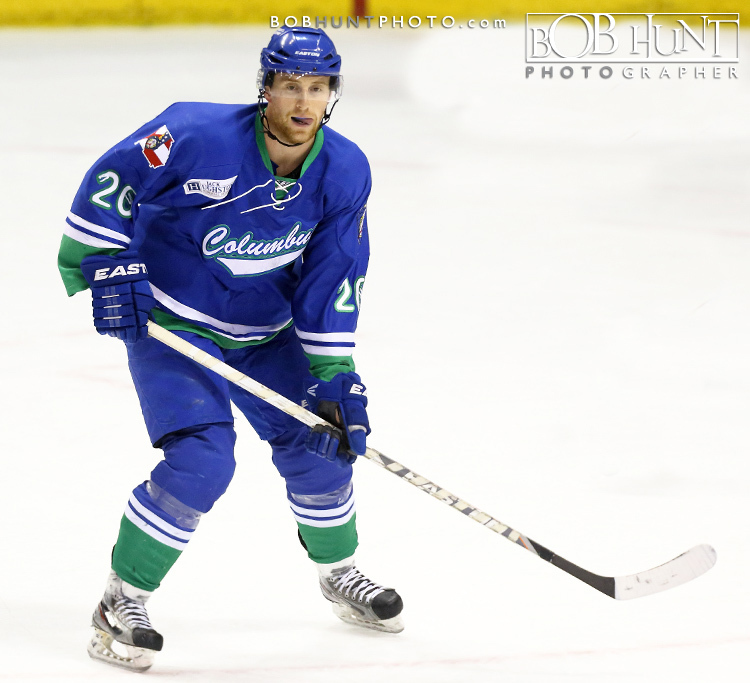 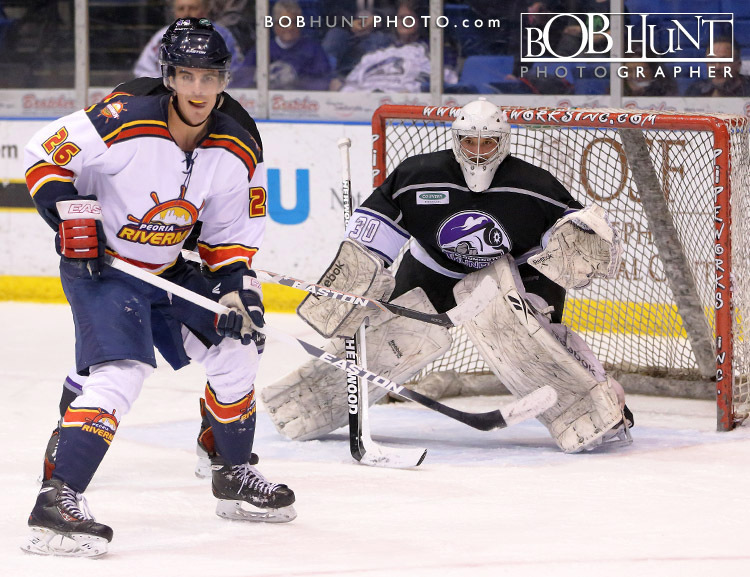 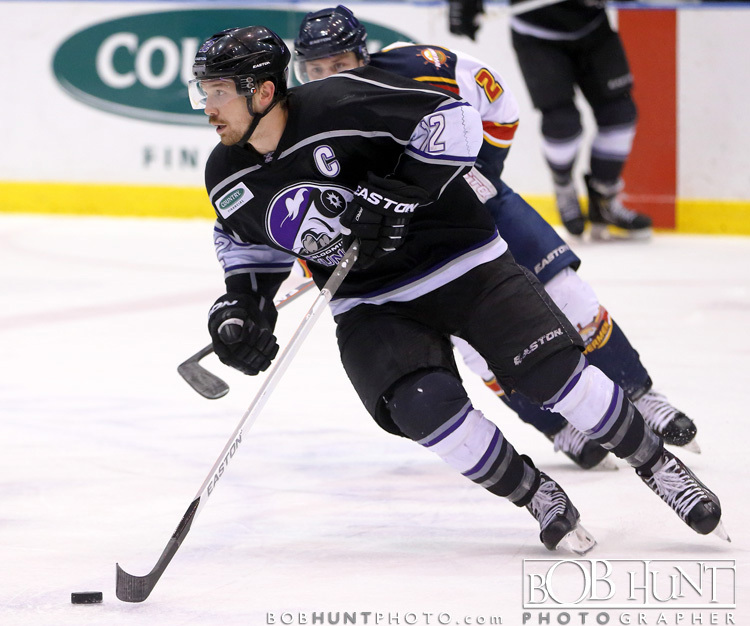 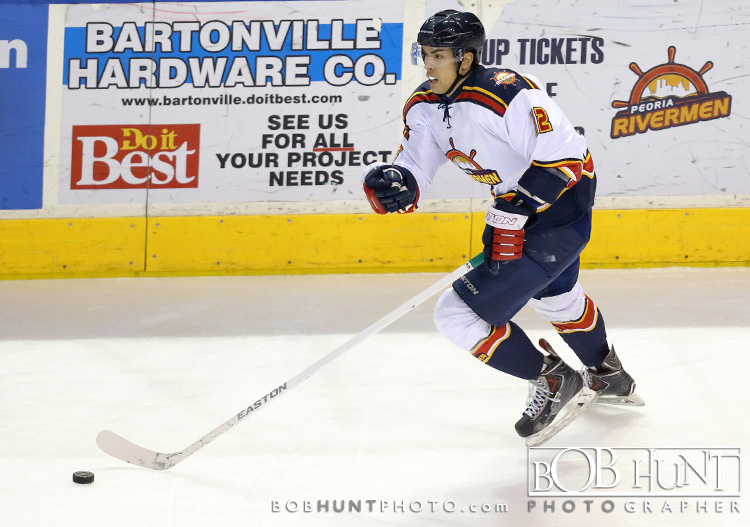 He is 14-5-0 on the season and 9-4-0 with the Rivermen since being traded from the Fayetteville FireAntz on Dec. 18 for future considerations. 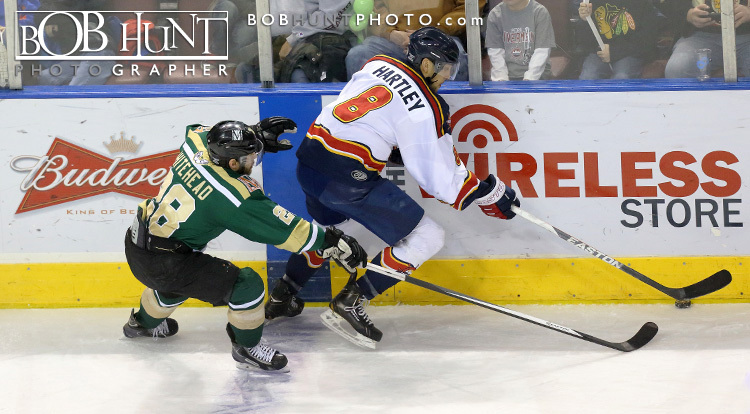 Rank dealt his second shutout of the weekend while Parker Stanfield notched two goals to lead Peoria to a 3-0 victory before 2,791 fans at Carver Arena.